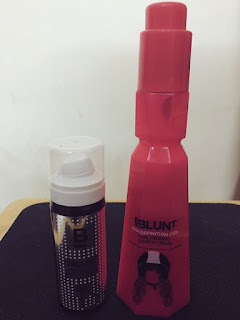 Jill Of All Trades: My hair loves BBlunt! A few weeks ago, two amazing surprises came in my mail. I wasn't really expecting it, so there was the excitement of a 5 year old inside me tearing apart the package. And out came the BBlunt High Definition Curl - Curl Defining Leave-In Cream. 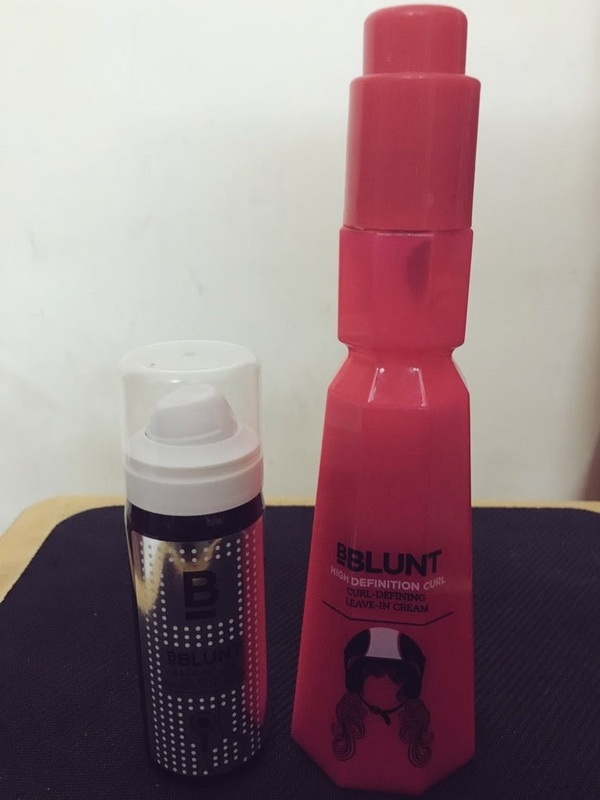 Followed by the Bblunt Back to life Dry Shampoo. At first I was a little disappointed on seeing the first product because I don't have curly hair. But when I read that It enhances curls & waves and also tames frizz, I decided to give the product a go. Curls need definition and this hassle-free cream makes it easy. It enhances curls & waves and also tames frizz. Go ahead, show your curls some love. HOW TO USE"Flip hair upside down and apply evenly on damp hair, from roots to ends. Twirl, scrunch and style. Blow dry using a diffuser for maximum effect." I have used the product 4-5 times till now. And I follow the instructions, applying it on damp hair, from roots to end. What I'm left with, are HAPPY HAIR! It totally defines my wavy hair and makes them look beautiful. You know when you get out of bed with oh-so-perfect wavy hair? It kinda gives that effect. My colleagues & friends have already asked me twice if I got a hair cut, coz it's usually the blow-dry they give you after a hair-cut that leaves your hair with defined curls and looking tamed. I tried applying the leave-in cream after just shampooing my hair (without conditioner) vs. after shampooing and conditioning my hair. When I apply it without a conditioner, my hair stay beautiful on Day 1, but get dry and brittle day 2 onwards. Hence I realised that the leave-in cream does not mean that you can skip your conditioner. And it's nowhere mentioned in the instructions too. I'm sure that if I had really curly hair, this would have been my most used & needed product. So if you've got maggi-noodle tresses, please give it a try. You can buy it online for Rs.550 a bottle. Now being someone whose hair get's oily pretty easily, and who has a very hectic life with times when there is no time in the morning to wash hair (need a separate agenda for hair-wash days); I have used and own a dry shampoo already. The one I have used is by Lush Cosmetics, and I love it but the only (and big) drawback is that it comes in a bottle wherein you have to take the powder in your hands, apply on scalp and brush hair. The outcome is pretty messy, and hands are left with the residue. So when I saw the dry shampoo in a spray bottle, compact version, I was thrilled. I happen to travel for work & pleasure from time to time. And I also happen to be a really lazy person. I'm sure the Dry Shampoo was invented by someone like me. This product is easy to spray & carry, and does what it says - absorbs the oil, leaving hair looking fresh. No more bad hair days with no other option but to tie a pony or hide the hair behind a scarf or something. Though, the other dry shampoo I have had a nice lemony scent, which I wish would be there in this one too. Comes in 2 sizes - 30 ml for Rs.250 and 125ml for Rs.550, and you can decide which one to buy on your usage and need of a compact bottle. I have used (and loved) a couple of other BBlunt products too, the One Night Stand is my all time favourite. I'm definitely going to try their range of shampoo & conditioners soon! In a country like India, vastu shastra remedies for home is considered one of the basic requirements while constructing a property or building according to pre-specified principles. It is necessary to follow these principles for wealth, health, fame and prosperity in life. Though it has become difficult to follow each and every principle in the present era, it is important to make maximum use of tenets in order to achieve peace and harmony in life. Think twice before getting a dream catcher!